As we were exiting the pool a week or so ago, I saw something dark and mysterious crawling along the base of our house. I slowly approached and saw the weirdest looking bug I have ever seen. I called Steve to get over there pronto, but by the time he did, the "bug" was gone. He said, "well, what did it look like?" And I said, "believe it or not, it looked like a small lobster." It was finally decided by my family that I was seeing things and perhaps it was just a trick of the light. I knew that wasn't true! And then I convinced myself that it was the biggest scorpion I'd ever seen and started wondering what I would do if I saw it again. And I was also hoping it wouldn't come into the house! A few hours later we realized we had not put the pool alarm back in the water so we went down to do so .... about midnight. 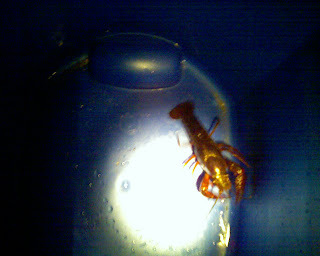 As Steve was putting the alarm in, I saw something dark in the shallow end, got a flashlight, and there was my "lobster!" Fished it out with a pool net and put it in a bucket where it signaled its anger by clattering its little claws against the side of the bucket. Steve said it was a crawfish or crawdad. Me - yuck - never have seen one before and never want to see one again. After we decided (rather quickly) that it couldn't live in our yard or pool, Steve took it to a small stream and released it to a friendlier environment. I hear people eat those things! Thank you for listening. He's in a mop bucket now, but when I found him, this crawdad was swimming around in the bottom of our pool.